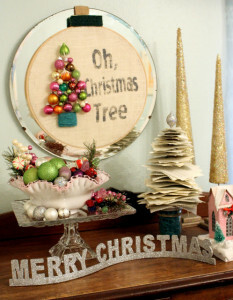 DIY Oh, Christmas Tree Wreath! 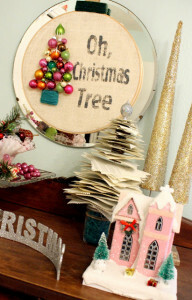 You are here: Home / Holidays / Making A Merry Christmas / DIY Oh, Christmas Tree Wreath! 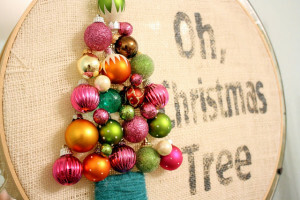 Each year I (Emily) get to spruce up my baby girl’s room for Christmas, and I love this easy and affordable idea for holiday decor – the Oh, Christmas Tree Wreath! 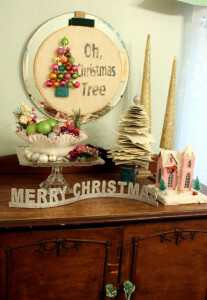 The two, thin gold trees were HomeGoods finds from last year and the paper tree was a project I featured previously. 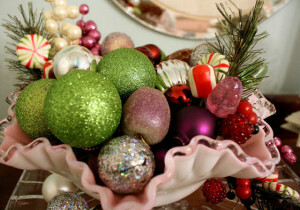 I added a cute, pink church and bowl o’ shiny ornaments and her room is officially spruced for Christmas! 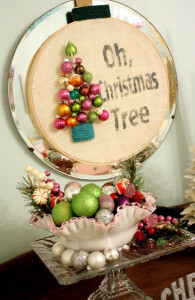 Do you like the Oh, Christmas Tree wreath? Well, stay put and I’ll break it down for you. 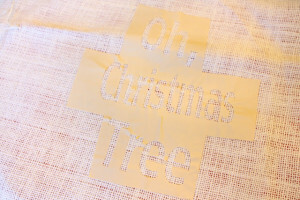 I started with a large, wooden embroidery hoop, a square of cream burlap, a handful of shiny, tiny ornaments, aqua and green yarn, a vinyl stencil and pewter fabric paint. Oh, and my hot glue gun. To stencil my words, I used my silhouette to first cut them out. Then I did the opposite of what I usually do. I discarded the letters and kept the negative space. For the sake of pictures, I should have chosen a different color vinyl, huh?? I then used a foam sponge to paint the stencil. 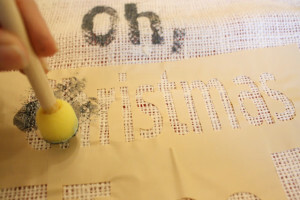 This is burlap, so it doesn’t have to be perfect. The weave kind of hides imperfections. I wanted it to look a bit aged and distressed, so I used a light touch when painting the letters. After the paint dried, I stuck the burlap in my hoop and trimmed the excess. Then I wrapped the top with a length of yarn. Easy as can be! 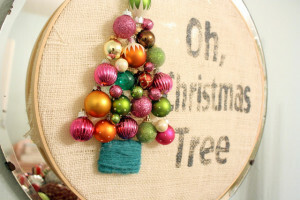 I glued the ornaments on after the burlap was placed in my hoop. This was also easy. 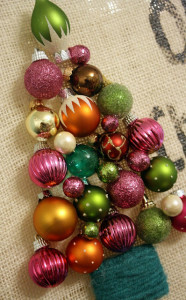 Simply, arrange your tree and glue each piece down with hot glue. 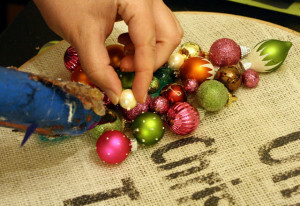 I put a scrap of fabric down under the hoop in case any glue dripped through the loose weave of the burlap. To make the tree trunk, I took a small cardboard square (a scrap of an old diaper box) and wrapped aqua yarn around it and then glued the trunk in place. Let me know if you try this project out. I’d love to see what you come up with!